Nominated for Best Music; Best Screenplay. At times like these, I revisit my internal 13-year-old. Back during my early adolescence in the late Seventies, I became a major Beatles fan. In fact, I rarely listened to anything other than the Fabs - solo or as a group - for the two years between the spring of 1979 and the spring of 1981; I then discovered the Stones and broadened my musical horizons. Kids these days don’t appreciate what we needed to do to enjoy filmed performances of our faves. Home video hadn’t erupted just yet, so we were stuck with the occasional revival of a flick at a local indie theater. Eventually I saw most of the Beatles’ movies this way. 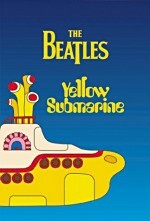 Yellow Submarine and Help! briefly hit the midnight circuit, so they weren’t too tough. Magical Mystery Tour ran once at a DC art house, and my fellow Beatle-loving friend Billy Hunt and I trekked into town one afternoon to see that ill-fated project. Let It Be took more perseverance. Actually, my only chance to take in a showing happened in the summer of 1980. My family went to Minnesota for my grandparents’ 50th anniversary celebration, and a local drive-in offered a triple-feature with The Buddy Holly Story, FM, and Let It Be. I didn’t care about the other two, so of course the theater planned to run Let It Be last. My Dad and I sat through all these other movies before I finally got to see the Beatles flick, and even then matters weren’t simple. A nasty summer hailstorm ran through the area during the showing, so I never did get to finish the screening; the theater pulled the print as the tiny bits of ice beat down upon us. At least I got to see most of Let It Be. Although it remains the Beatles’ most famous flick, I never took in 1964’s A Hard Day’s Night until home video became more popular. Actually, I don’t recall exactly when I initially watched Night, but I know it occurred after my early Beatles passion dissipated. I’ve maintained my love for the band across the last two decades, but my ardor will never replicate those old feelings, so Night will never create the same impact it would have had in 1979 or 1980. But that doesn’t mean that I don’t really like the flick. Night maintains a reputation as the Beatles’ best movie, and it deserves it. After almost 40 years, Night remains a lively and compelling piece of work. Night features a plot that can be described as “thin” at best. Essentially, it purports to display a day in the life of the Beatles. Slated to make an important TV appearance, the boys feel weighed down by all their responsibilities and constantly try to get away for a break. However, manager Norm (Norman Rossington) and his assistant Shake (John Junkin) always wrangle them back into the fold. To complicate matters, Paul’s grandfather (Wilfrid Brambell) gets foisted upon the Cute One. 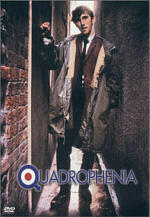 A sneering troublemaker, the old man acts as a monkeywrench and causes many problems for the band and their handlers. Basically, Night alternates between random escapades and musical numbers. The Fabs take a train ride and meet some young birds. They go to a dance party. They hold court at a press conference. Again, none of these exist to further the plot, because there really is no plot. 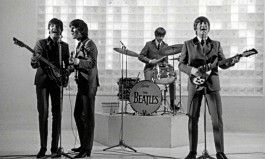 The movie climaxes with a desperate hunt to get Ringo out of jail in time for the TV show, but otherwise, the movie exists largely as a group of loosely connected vignettes. That may sound like a flaw, but it really isn’t. If forced to choose a complaint about Night, it’d relate to the integration of the musical numbers. Though some pop up fairly naturally, usually they come out of nowhere. That abruptness can seem jarring, but it doesn’t actively harm the film. The dance party scene works worst of the bunch, as it really feels like filler. It helps that the songs are uniformly excellent. Though I love all stages of the Beatles’ career, I feel a particular fondness toward their early work. Those songs offered a bright energy and honestly that became somewhat lost during the more experimental material from later years. To be sure, this isn’t a criticism of the more ambitious tracks, but I love the clarity and freshness of the first few years. Night stands as the band’s best work from that period. The first album comprised totally of Lennon/McCartney songs, it includes not a single weak number, and many of the tunes remain absolute classics. 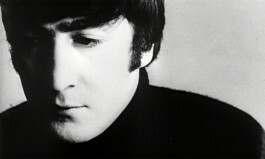 If forced to choose the best of the bunch, I’d go with John’s stunning ballad, “If I Fell”. Love songs rarely achieve its level of warmth without any sense of sappiness. It really doesn’t get much better than “Fell”, and I think that Night likely offers the greatest soundtrack album of all-time. Even without all those great tunes, Night would offer a terrific experience. In addition to a bright, clever and peppy script from Alun Owen - a fellow Liverpudlian who nicely connected with the band’s sense of humor - Night enjoys crisp and irreverent direction from American expatriate Richard Lester. Not just some hack, Lester gives the movie its sense of brisk energy and he grounds its tone of flippant silliness. Much of the movie shows the Beatles’ antipathy toward the staid establishment, but this never comes across as snotty or gratuitous. For an example of the latter, look at something like the atrocious Harold and Maude, an anti-establishment movie that denounces rules solely due to a hippie sense of entitlement. In Night, the Beatles earn their attitude. The film clearly establishes the accurate tone that the Fabs went through daily, and it wasn’t strictly generational. Authority figures generally treated the boys as a commodity and saw them as almost sub-human, an attitude aptly displayed when George inadvertently ends up in a meeting with a snide ad executive. While consistently fun and lively, Night provides some depth as it depicts the negativity often aimed at the band. Night also succeeds due to the remarkably natural performances by the Beatles. Granted, one might think it can’t be too tough to play yourself, but in truth, the Beatles represented here are exaggerated versions of the Fabs. In any case, they still needed to deliver lines and put on performances, and they generally do quite well. 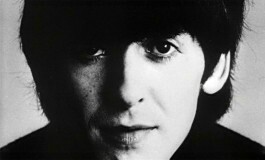 Ringo received the highest praise, largely because his character displays the most emotional depth. However, I think I most like George here, as he offers many of the film’s highlights. I love the scene at the ad agency, as George wonderfully deflates the arrogant pitchman. 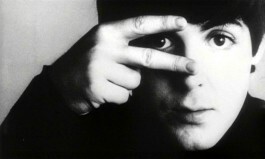 Of the four Fabs, only Paul comes across as somewhat weak. Paul always was the most showbiz minded Beatle, and he simply tries too hard to Act, whereas the others clearly relaxed and didn’t take matters too seriously. Paul does decently in the film, but he stands out as somewhat forced, which is probably why he receives less screentime than the others; I can actively think of good moments from the other three, but I can’t recall a single standout piece from Paul. Night also enjoys a terrific supporting cast. While all do well, Brambell sticks out for his wonderfully abrasive performance as Paul’s grandfather. Brambell may create the least lovable and sentimental old man ever filmed, as he turns him into a hard-edged and sneering presence. All he does throughout the movie is create problems for the others, but he does so with such a gleeful sense of malice that I like him anyway. 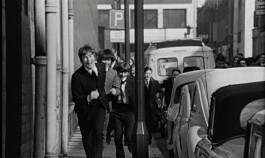 A Hard Day’s Night may not offer a perfect film, but I can’t think of a better flick in the genre. Probably the best rock movie ever made, it remains bright and funny after almost 40 years. This one’s pure fun, and the music ain’t too bad either. 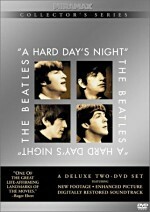 A Hard Day’s Night appears in an aspect ratio of approximately 1.66:1 on this single-sided, dual-layered DVD; the image has been enhanced for 16X9 televisions. Although it showed its age and budget limitations, Night offered a generally satisfying visual experience. Sharpness seemed good as a whole. At times, the picture came across as a little soft, but those occasions occurred infrequently. Most of the movie appeared reasonably crisp and well defined. Jagged edges and moiré effects created no concerns, but I did notice a smidgen of edge enhancement at times. Black levels tended to look very solid. 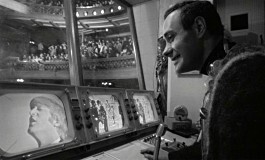 The movie displayed deep blacks and showed fine contrast as it presented a rich black and white image. Shadow detail also came across as appropriately dense but not overly thick. Not surprisingly, print flaws caused most of my criticisms about Night. Light grain appeared during much of the movie, and I also noticed speckles and grit on a fairly consistent basis. Though less frequent, spots and lines also showed up, and some more significant concerns manifested themselves on other occasions. For example, during the press conference, I noticed a few large scratches and tears, and other examples of blotches and dirt appeared. 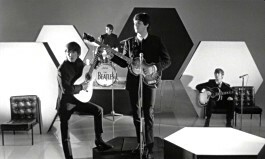 Ultimately, A Hard Day’s Night presented a pretty decent image, but it displayed too many flaws to earn a grade above a “B-“. The film’s aspect ratio has caused confusion. I wish I could clear up the issues, but I’m a little muddled about it myself. Virtually all prior video incarnations of Night showed it at 1.33:1, and some seemed to claim this was the theatrical ratio. Even Criterion - sticklers for OAR - used 1.33:1. However, I’ve also heard that the film was commonly projected 1.66:1 back in 1964. Does this mean that technically both ratios are correct? It sure looks that way. I felt less positive about the Dolby Digital 5.1 soundtrack of A Hard Day’s Night. The movie originally featured a monaural mix, and the soundfield generally remained consistent with that source. Music usually displayed stereo imaging, as the songs spread to the sides. However, the stereo tracks came across as rejiggered mono. The material didn’t seem to come from the studio stereo recordings, and they displayed a fairly mushy presence that didn’t delineate the instruments cleanly. As for the other parts, speech stayed in the center, though it occasionally bled inappropriately to the side speakers. Effects usually remained in the middle as well. They also showed a little bleeding, and they mainly cropped up from the sides only at the end of musical sequences; oddly, right before the image collapsed back to the center, some effects would bleed to the sides as part of the music. This seemed sloppy and distracting. The only sequence that notably displayed active non-centered effects came during the climactic TV concert; the sides and surrounds offered screeching from the crowd. Otherwise, the audio remained heavily anchored to the center channel when it didn’t present music. I wish I could state that Night offered good quality, but the package seemed average at best. Some of the concerns clearly related to the film’s origins. Speech came across as fairly flat and also appeared brittle and edgy much of the time. I always understood the lines, but the dialogue sounded pretty rough. Effects showed similar thin tones and lacked much heft. No problems with distortion occurred, but those elements seemed tinny and lackluster. However, I didn’t feel surprised by those pieces. Night was a cheaply made film from 1964, and those elements always sounded pretty bad. I thought the quality of the music seemed more disappointing. Though songs like “And I Love Her” and “I’m Happy Just to Dance With You” appeared moderately crisp and rich, many of the others came across as dull and muddy. The track seemed absurdly bass-heavy, as low-end elements dominated the tones. This washed out the clarity and made the mix seem muddy and dense. In addition, I heard some hum and background noise at times. Given the age of the material, the 5.1 mix of A Hard Day’s Night wasn’t a total disaster, but it offered a disappointment nonetheless. Prior to its release, no one seemed to know if this DVD would include the film’s original monaural track. Unfortunately, it didn’t appear on the disc. I would have preferred that mix to this one’s inconsistent and mushy track. Well, at least this multi-channel version corrected some of the old stereo track’s mistakes. When the older one went to stereo for music, it omitted effects cues that appeared during the original movie. For example, when George knocked over an amp during “If I Fell”, no sound occurred. The new track included that kind of effect, so at least it better replicated the original mix. Most of this package’s extras appear on DVD Two, but the first disc includes some components. Things They Said Today provides a general documentary about the production. It runs 36 minutes and 15 seconds and features the usual mix of movie clips, archival materials, and new interviews with participants. In the latter category, we hear from former United Artists executive David Picker, music producer Sir George Martin, Beatles publicist Tony Barrow, actors Victor Spinetti, Lionel Blair, John Junkin, Jeremy Lloyd, Anna Quayle, and Terry Hooper, movie producer Walter Shenson, director Richard Lester, screenwriter Alun Owen, associate producer Denis O’Dell, musician and Beatles acquaintance Klaus Voorman, second assistant editor Roy Benson, hairdresser Betty Glasow, photographer Robert Freeman, tailor Gordon Millings, cameraman Paul Wilson, and director of photography Gilbert Taylor. Phew! That’s a large roster of folks, but don’t expect equal participation from all of them. Some of the people pop up for only a line or two, while others provide more substantial participation. Of this crew, we hear the most from Lester, Shenson, and Picker. Overall, “Said” offers a fine overview of the production. We learn how the project came into existence and go through a myriad of aspects of the shoot. We get notes about the script, the locations, the additional cast, working with the Beatles, the music, the film’s reception, and many other elements. “Said” gives us a consistently entertaining and informative piece. Also on Disc One we find a collection of DVD-ROM materials. First we get a “Screenplay Viewer with Dual Script Versions”. This lets you alternate between an original screenplay with some handwritten notes as well as a final edition. This kind of feature always seems fun, and the additional flexibility makes Night’s presentation all the more useful. In addition, the DVD-ROM area provides a link to the “DVD Destination Site”. This offers some nice bits such as a “Scrapbook Photo Gallery”, a “Roundtable Audio Discussion”, and a few links. The “DVD Website Archive” also provides the materials put online for the film’s 2001 reissue. Night doesn’t back scads of DVD-ROM extras, but what we find seems good. As we move to DVD Two, we find different collections of interviews organized into different areas. Virtually all of these clips come from the same sessions that comprise “Things They Said Today”, but it doesn’t appear that disc two’s pieces duplicate bits found during that documentary. Their Production Will Be Second to None focuses on the filmmakers. It starts with Look at My Direction. In this 12-minute and five-second program, Lester quickly chats about his early career and then he moves to his experiences on Night. He discusses how he wanted to expand the Beatles’ personalities in an artificial manner - for example, he played up John’s cynicism and Paul’s mushiness and he also discusses the different Beatles. Of all the interview subjects, Lester may be the most compelling, and his chat seems funny and informative. Next we hear from Sir George Martin. Then There Was Music lasts seven minutes and eight seconds as he relates some general Beatle experiences as well as a few Night specific comments. Better Hurry ‘Cause It May Not Last gives us three minutes with studio executive David Picker. He provides some fairly generic and uninteresting remarks about his experiences that mostly just praise the product and the participants. 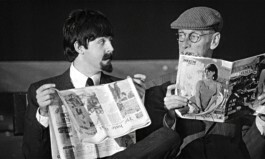 With the Beatles concentrates on some of the actors seen in Night. Of this crew, the most significant role belonged to John Junkin, and we get four minutes of his memories in Shake It Up Baby. He covers his start as an actor and adds a few fun Beatle-related anecdotes. Happy Just to Dance chats with Lionel Blair, the film’s “TV Choreographer”. During his two minutes and 43 seconds, he discusses the creation of his scenes plus a few Beatle interactions. In The Future Still Looks Good, we hear from Kenneth Haigh, the actor who plays “Simon Marshall”. (“Who?” you ask? He’s the fashion executive who solicits George’s opinions.) In this two-minute, 48-second bit, Haigh gives us a little perspective about his experiences and his remembrances of Beatlemania. 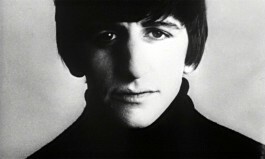 This domain’s longest piece, That Boy… offers comments from David Jaxon, the “Young Boy” who interacts with Ringo. During the 10-minute clip, he chats about his experiences on the set and his Beatle memories. Give Us a Wink… presents 161 seconds from Anna Quayle, the actress who plays “Millie”, the woman who John convinces he’s someone else. She tells us about her interactions with John both on the set and during a chance encounter years later. For I Act Like a Clown, we get four minutes and 40 seconds from “Club Dancer” Jeremy Lloyd. Since he didn’t do much in the movie, he mostly comments on the Beatles and their place in society at the time. During Well I’ll Bet You, “Casino Croupier” Terry Hooper provides some specifics about his scene as well as a few of the usual more general “what the Beatles meant to the world” notes. Working Like A Dog looks at the film’s production crew. Here to Show Everybody the Light offers statements from director of photography Gilbert Taylor. During the seven-minute and 16-second piece, he tells us how he got into the field and covers some of his résumé and specifics about Night. Taylor offers one of the better chats found on this DVD, as he gives us some good details. Remaining in the same field, Tell Us What You See provides a four-minute and 15-second conversation with camera operator Paul Wilson. He concentrates on the technical side and gives us some informative notes about various challenges and the innovative techniques used during the concert sequences. For Every Head She’s Had the Pleasure to Know, hairdresser Betty Glasow offers two minutes and 51 seconds of her styling interactions with the Beatles. Lastly, during We Shall Scrimp and Save, second assistant director Barrie Melrose chats for five minutes and 57 seconds about working with the extras and a few other general thoughts. Busy Working Overtime offers remarks from the post-production crew. In the Thick of It gives us four minutes from assistant editors Pam Tomling and Roy Benson. They provide general and somewhat uninteresting comments about their work; most of these consist of praise for editor John Jympson. Every Sound There Is… gives us 163 seconds from sound editors Gordon Daniels and Jim Roddan. Mostly they chat about the challenges presented by all the teenage screaming. Listen to the Music Playing In Your Head includes only one feature: Sir George Martin’s Song-By-Song Perspective of the Film’s Soundtrack. This 11-minute and 41-second piece offers what it promises, as we hear Martin’s comments about each tune that appears in the film. This is a very interesting and useful program that gives us some compelling details and opinions. Such a Clean Old Man! gives us Memories of Wilfrid Brambell - the Film’s “Clean Old Man”. 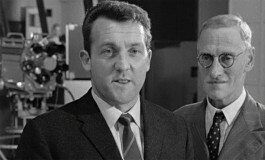 In the five minute program, we hear from Richard Lester plus Steptoe and Son creators Alan Simpson and Ray Galton; Brambell starred on that British TV series. They give us some comments about the man and his career. This program’s useful if for no reason other than the fact it explains to us why so many characters refer to Paul’s grandpa as “clean”. I’ve Lost My Little Girl focuses on Isla Blair, the Actress Who Ended Up On the Cutting Room Floor With Paul. We hear from Blair as well as director Lester and assistant editors Tomling and Benson. They discuss the omitted scene’s contents and why it didn’t make the film. 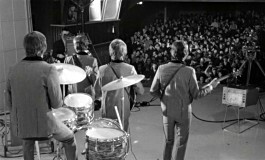 Blair also reveals her reactions to the suffocating fame the Beatles encountered. Unfortunately, while we see stills from the shoot, we don’t get to watch the scene itself. 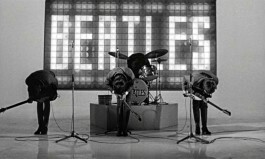 While many of the interview subjects on this DVD only briefly and tangentially knew the Beatles, Taking Testimonial Pictures gives us someone who worked more closely with them. We hear from Robert Freeman - Photographer and Designer of the Film’s End Title Sequence and the Original Movie Poster during this nine-minute and 53-second program. Freeman provides interesting remarks about the creation of the With the Beatles cover as well as the Hard Day’s Night material. For an insightful look at the Beatles’ influential fashions, Dressed to the Hilt A Special Fitting With Gordon Millings - One of the Beatles’ Tailors. During the seven-minute and 34-second piece, Millings - the son of the Beatles’ tailor - shows us some of the clothes and also talks of their development and provides some anecdotes. 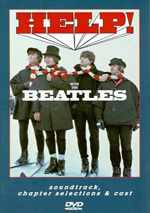 One of the longer pieces, Dealing With “The Men From the Press”… gives us A Briefing with Beatles Publicist Tony Barrow. During the 17-minute and 48-second program, he covers a mix of topics about working with the Beatles in their early days. He provides some good notes and gives us a nice idea of what the experience was like from the inside. They and I Have Memories… gives us thoughts from another close companion. In Recollections of Artist and Musician Klaus Voorman - Longtime Close Friend of the Beatles, we get seven minutes and 25 seconds of his interactions with the Fabs. Though most folks never heard of him, Voorman really did maintain close contact with the boys; he designed the cover to Revolver and played bass on Plastic Ono Band and other solo LPs. His comments don’t reveal a lot, but they seem reasonably interesting. In the final interview section, Hitting the Big Time In the USA, we get Reminiscences By Sid Bernstein, Promoter of the Beatles’ Carnegie Hall and Shea Stadium Concerts. The three-minute and 51-second piece includes his statements about how he got the Beatles to come to the US and also his interactions with manager Brian Epstein. All told, these various interviews add up to nearly three hours of footage. While that’s certainly a lot of material, I couldn’t help but feel somewhat underwhelmed by the whole experience. Some of the pieces seem very informative and interesting, but many feel like tangential fluff. The absence of any actual Beatles definitely harms the set. According to a prominent Beatle fansite, only projects owned by Apple will provide Beatle involvement. That also apparently explains the muddiness of the sound, as the movie’s remix couldn’t come from the source material. Some folks have come down on the collection of interviews due to the “talking head” syndrome. If you hate that format, you’ll indeed not like these clips. Though some movie bits and stills appear, mostly we see older folks talk to the camera. This doesn’t bother me, however; I just wish the content itself seemed stronger. Despite the lackluster nature of some of the interviews, though, I appreciate their inclusion. I’ll always support more content versus less; even if something doesn’t do much for me, it’s still better than nothing. Clearly the DVD’s producers were somewhat hampered by their apparently inability to access the Apple archives, so this may be as good as it’ll get under the current legal circumstances. Since I was negative-three-years-old when A Hard Day’s Night hit movie screens, I can’t fully appreciate the flick’s impact. However, when I watch this delightful and intelligent piece, it gives me as good an approximation of Beatlemania that I’ll ever get. After almost 40 years, Night remains a lively and witty film that continues to provide an enjoyable experience. The DVD offers generally decent picture with moderately flawed sound and a long but inconsistent package of extras. Though this set doesn’t give us the definitive A Hard Day’s Night release, I still feel happy with it and recommend it to any Beatle fan.